It’s officially autumn, which means that Christmas is not all that far away. From the first Christmas cards and Quality street boxes to well, pumpkin spice everything. There’s no denying that this year isn’t flying by. Christmas is for a lot of the population a time of both tradition and change. Tradition in that you get the same old stockings out on the fireplace, raid the selection boxes and bring out the same decorations. Sometimes, change is needed, and even something easy like mixing up your table decorations can make Christmas dinner more exciting. Christmas table runners can be a simple way to change your decoration and the look of your table without blowing the budget. 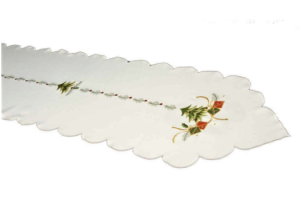 Our Christmas table runners come in many different colours and designs, from cream with embroidered gold to red poinsettia. A simple change in design can be all your table needs for a brand new look. This Jacobean Jaquard Woven gold Christmas runner is a neutral colour and will go with most Christmas tablecloths you might already have at home. It has a stylish woven jacquard gold leaf design, it is made from easy care 100% polyester making it machine washable with little or no need for ironing. This Christmas runner also comes in three different sizes meaning it can fit tables ranging from six to ten seats, perfect if you’re entertaining guests for dinner. While this Christmas runner looks great in gold, it also is available in red and silver. We also have tablecloths available in the same range. 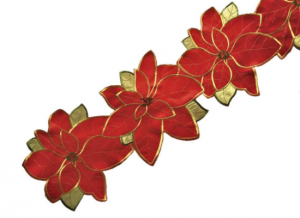 This Poinsettia Grande Christmas table runner is an eye catching piece for the centre of your table. It’s an applique and embroidered Christmas runner and will fit perfectly down a six seater table. This Christmas runner can be used with many different colours of tablecloth but would most likely suit a neutral background as its vibrant red and green design will take centre stage on your table. This piece is machine washable and very easy care, perfect if someone spills cranberry sauce all over it. A more traditional choice for a Christmas runner is this embroidered spruce tree with gifts design. It is an ivory background with red, green and silver quality embroidery. This would ideally suit a bright coloured tablecloth underneath such as red or green. However,even with a more neutral colour cloth the embroidered design is very pretty and will stand out on its own. This design will fit a six seater table, however, there are more sizes available. This Christmas runner is also machine washable, made from 100% polyester and requires little or no ironing. These are just three of our designs of Christmas runners, however, we have many more. If you cannot find what you are looking for, just contact us and we will do everything we can to help. 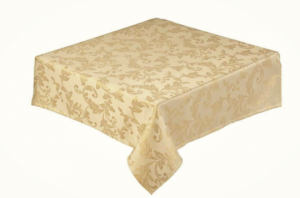 Most of our ranges have matching items such as tablecloths, runner and napkins. This makes it easy to kit your whole table out in time for Christmas.